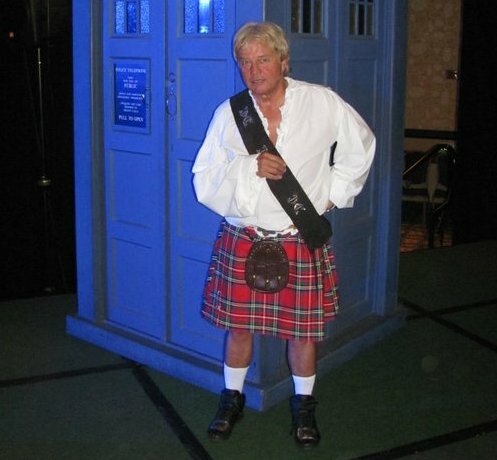 Frazer Hines went to Montreal for the local Comic-Con, and gave an interview to the Vancouver Sun. Most of it should be fairly familiar to fans - Troughton is his favourite Doctor, he played the character who had to have everything explained to him, etc. - but it's nice to have his opinion of Peter Capaldi in print. To wit: "“I think Peter Capaldi will be marvellous...He’s got this wonderful Doctor face that people could believe as he walks into a room. But he’s also got a twinkle in his eye, a twinkle that he could be a little bit of fun as well.” There's also a tantalising bit where he's talking about how much he'd like to return to the show, perhaps "in a Scottish ruin...Their eyes meet and they click, click, click and they realize who it is...And he says, ‘Well, you better get a shave and have a shower and join us back at the Tardis.’" Hines is still busily publicizing Fifty Shades of Frazer, but we already wrote about that here.